SUSPENDED AT PRESENT --NEEDS A NEW LEADER?? Group Leader: Vacant at present!! 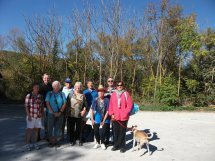 The Walking group meets on the 4th Friday of the month and is a sociable group of amblers and ramblers who walk for pleasure. 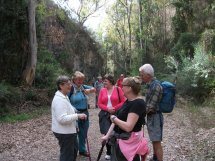 Our members are of varying ages, nationalities and of average fitness, Some of the walks are tailored to those who can no longer manage strenuous climbs and others are more challenging. We have nearly fifty registered members but average between 10 and 20 regular walkers plus dogs. 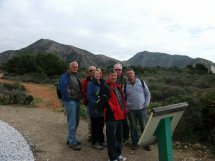 The group has been going for over six years now and we have completed over thirty walks in the Axarquia coastal and campo areas and further afield including a four day trip to the Alpujarras. Our aims are to discover new places and enjoy the wonderful flora and fauna of the region. We encourage members to lead walks and share ideas for new ones. Most of the walks are between 2 to 3 hours in length and between 5 and 10 kms. All you need is enthusiasm and a good pair of walking boots. So if you fancy a ramble in this beautiful area one Friday, do come and join us.